All transactions are safe and secure with a reliable history in online purchasing behind each of our associates. Buy the All Valley Karate Championship '84 t-shirt to own Karate Kid clothing and merchandise. Who can forget the 1984 All Valley Karate Championship, which featured some of the best young fighters from the Cobra Kai dojo, including Johnny Lawrence (William Zabka). 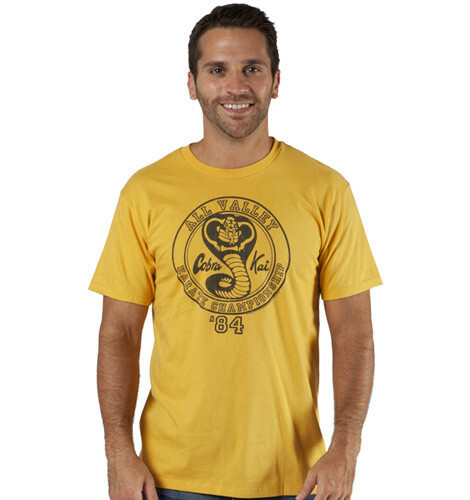 Now you can represent Cobra Kai with this vintage gold Karate Kid t-shirt that's great for a day filled with both play and relaxation. You can even wear it for a little playful karate sparring with your friends! In addition to the All Valley Karate Championship '84 tee above, browse the Karate Kid Clothing Gallery for more apparel like men's and women's clothes, kids shirts or hoodies.